Aumenta tu ocupación así como tus ventas con el channel manager de Smoobu. Ya sea que ofrezcas solo tu apartamento privado en Airbnb o quieras comercializar tu cadena de apartamentos en Booking o Expedia. Para cada tipo de estructura, existe un canal de reserva ideal. Con nosotros, lo puedes controlar todo. Las reservas de alojamiento hechas en un portal se detectan y se bloquean en los otros portales para ese periodo. Smoobu también reconoce las modificaciones y cancelaciones. Las reservas de todos los portales aparecen en la lista de reservas y en el Cockpit de Smoobu. No te preocupes nunca más por las dobles reservas. El channel manager de Smoobu asegura que la ocupación de tu alojamiento coincida en todos los portales. Obtiene beneficios de los grandes portales internacionales como Airbnb, Booking o Atraveo y conéctalos según sea necesario con otros portales regionales. Un channel manager sincroniza automáticamente el calendario de disponibilidad entre los diferentes portales. Los portales son, en nuestro caso, quienes se ocupan de gestionar el alquiler de los pisos de vacaciones. Si tú alquilas un apartamento en Airbnb y Booking.com y recibes una reserva a través de uno de estos motores de reserva, el channel manager asegura que se bloquee el alquiler en el periodo solicitado. El channel manager realiza esto mismo sin ningún esfuerzo adicional, pero en varios portales. Así pues, el channel manager le permite expandir su oferta y hace que sea más fácil encontrar sus pisos en otros portales. Todas las reservas recibidas de sus clientes directos o mediante canales alternativos deben ser incorporadas al channel manager de Smoobu y el software se asegurará de que todos los portales queden bloqueados. Funcionamiento de la sincronización de los precios de Smoobu para Airbnb, Booking.com, Expedia, etc. Gracias a Smoobu puedes sincronizar tus precios de manera muy fácil. Solo necesitas definir tus precios en Smoobu y elegir un porcentaje de aumento para cada portal, de modo de adaptarlos. De la misma manera, puedes guardar tus tarifas y solo cambiarlas según el día, el periodo o la estación. ¿Ofreces tu alquiler como casa entera y también como unidades separadas? Manejar esa combinación puede ser muy difícil y laborioso. Smoobu lo hace más fácil. Imagínate que tienes 3 anuncios en Booking.com: la casa entera y dos sub-unidades. Cuando se hace una reserva para el alquiler de la casa entera, Smoobu bloqueará las dos sub-unidades. De igual manera, cuando una sub-unidad es reservada se bloqueará la posibilidad de alquiler la casa entera, pero siempre se podrá alquilar la última sub-unidad. Además, la sincronización instantánea con los otros portales representa una gran ventaja para manejar estas situaciones. Smoobu es compatible con los portales de reservas locales e internacionales más eficientes y también con otros portales regionales, permitiendo atraer a visitantes específicos. Las posibilidades son ilimitadas. La elección de los portales más adecuados es un factor determinante de éxito. En el panorama de Smoobu, encontrarás todas las estadísticas actualizadas sobre el rendimiento de cada portal de reservas. Ampliamos continuamente la cantidad de portales de reservas con que conectar. Debajo encontrará la lista de los portales ya conectados. En caso de que no esté el canal que estás buscando, contáctanos y lo intentaremos conectar con la mayor brevedad posible. 9 Flats is an advertising portal for private rentals. Abritel.fr is now part of the HomeAway network and also shares the platform with it. Founded in 2008, Airbnb has become one of the largest vacation rental portals in the world. Particularly in urban regions Airbnb is strongly represented and ensures high utilization for landlords of holiday accommodations. Atraveo has about 300.000 holiday homes and holiday apartments in Europe and all over the world. Atraveo markets internationally, both through the Atraveo brand and through Tuivillas. Atraveo was founded in 1997 and now belongs to the TUI GROUP. Bedandbreakfast.eu was founded in 2009 in Eindhoven. It is the world’s largest booking platform for Bed & Breakfasts and is used by millions of people every year. Bedandbreakfast.eu has set the following criteria for property owners: “Your accommodation is not to exceed 15 guest rooms. In addition, guests must be personally welcomed and a full breakfast must be served or provided. Bed y Casa emerged from a personal blog in 2007. The Bed & Casa’s mission is “to offer a different way of traveling cheaper and more authentic. Bemate has focused on selected apartments and looks at the listing with the team before they enable it to be booked. Go-fewo is a leading site in the field of holiday accommodations, furnished apartments and villas. The regional focus is on Europe, Turkey, and the Middle East. Go-fewo.com and flat4day.com have the same listings. Booking.com is a booking portal for accommodations of all types, established in the Netherlands in 2005. Booking is available in 41 languages and is one of the world’s leading booking portals. Be part of one of the largest booking channels. Ebab.com offers private accommodation of gay or gay-friendly hosts in 560 cities and 72 countries worldwide. At the beginning of 2000, e-domizil was founded by ten shareholders from the fields of business and finance. E-domizil is a booking platform for holiday accommodations. Expedia is an American online travel agency. The company headquarters of Expedia is located in Bellevue, Washington State. According to own data, Expedia is the fourth largest travel agent in the US. Expedia is not only a booking portal for holiday accommodation but offers the entire portfolio of an online travel agency from travelling to vacation rentals and hotels. Flipkey is a company of Tripadvisor. On FlipKey listed accommodations have a reach of nearly 340 million visitors per month through FlipKey and Tripadvisor. Ferienwohnungen.de is a travel agent for worldwide holiday apartments and holiday homes. All requests and bookings go directly to the owners, as a rule no fees arise. Ferienwohnungen.de was founded in 1998 and is based in Glücksburg on the Baltic Sea. Since its establishment in 1997, FeWo-direkt has been focusing on vacation rentals. FeWo-direkt now belongs to HomeAway, the largest market place for holiday accommodations. Flat4Day is a leading site in the field of holiday accommodations, furnished apartments and villas. The regional focus is on Europe, Turkey, and the Middle East. Go-fewo.com and flat4day.com have the same listings. Morning Croissant has dedicated itself to the last minute and budget traveler. Price are usually between € 20-60 per night. Morningcroissant leads only exclusive partnerships with real estate agencies, hence their listings are found nowhere else. The company is based in Paris and has its focus on the French-speaking world. HomeAway operates the largest marketplace for vacation rentals worldwide. Among others, HomeAway also operates the FeWo-direct site. Holidaylettings has been in existence since 1999. Holidaylettings offers all kinds of holiday accommodations, from small huts, noble villas to campers. Housetrip belongs to the Tripadvisor group and is therefore connected to all portals of this. Hence it has an enormous reach. Misterbnb lists a wide range of accommodations worldwide and focuses on the gay community. The aim is to bring the gay community together and to be able to rent “cozy places in more than 130 countries with like-minded people”. Established in 2003, Only-apartments is a company specializing in short stays. In contrast to many other providers, Only-apartments only requests the customer’s reservation fee to guarantee the booking. The price of the rent is paid afterwards. Red Apple Apartments focuses on larger European city. Marketing activities however focus on the Nordic regions. Hence, if you would like to receive guests from the far north, list your apartment here. An average of 9 nights is booked by Roomorama users, amounting to $ 1,000. This corresponds to more than twice the branch average. 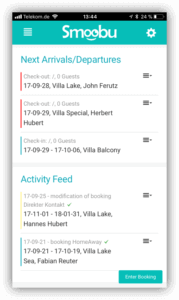 So if you are interested in longer stays, Roomorama is an interesting booking platform for you. Established in 2001 Traum-Ferienwohnungen brings together vacation rental owners and guests. Apartments can be found in 72 countries. Tripadvisor is THE evaluation platform for accommodations, restaurants, places and all aspects of travel. To benefit from this portal and to promote your own accommodation through reviews and the community, you should check with Tripadvisor. Travanto is a booking portal for holiday accommodations with a focus on the regions of Germany and Europe. Tuivillas is an international holiday home portal of the Tui Group and operated by Atraveo. Wimdu was founded in Berlin in 2011 and is active worldwide. Wimdu has set itself the goal of promoting private accommodation stays and making it a global standard. Meanwhile, Wimdu has been sold to the Danish apartment manager Novasol. Waytostay, established in 2004, is an online rental agency for apartments in Europe’s “top cities”. Since 2001 vacation-apartments has existed and brings together travellers and hosts of private holiday accommodations. Apartments can be found in 72 countries. VRBO is an American listing site for vacation rentals that belongs to the HomeAway Group. You can find holiday accommodations from 190 countries. The company is based in Austin, Texas.